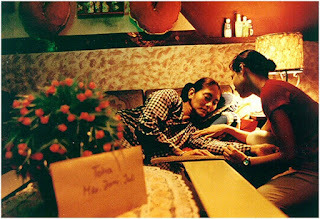 Winner for Best New Director at Singapore, Dragon & Tiger Awards at Vancouver, Best Actress for Jajang C. Noer at Cinemaya and Best Supporting Actress for Rachel Maryam at Indonesian Film Festival, "Eliana, Eliana" was released when Indonesian Cinema was treading its path towards the resurrection of the industry. After a tough day, Eliana arrives home and she is surprised by the visit of her mother. Eliana and her mother, Bunda, have not met for several years since Eliana ran out from her and the prospect of an arranged marriage back in Western Sumatra. At the same time Heni, Eliana's roommate, is nowhere to be found. Bunda tries to persuade Eliana to come back home, while Eliana is desperately searching for Heni. During their search, they try to communicate with each other and to break the ice between them along the way, as they experience the influence of the sights and sounds of Jakarta. Riri Riza directs a film about a mother-daughter relationship and all of the conflicts that arise due to the tradition of matchmaking. Eliana is a young girl who expects to see the world by her own decision, while Bunda is a more conservative and stiff person. The pace of the film, as is slow, as it is implemented by Sastha Sunu,s editing, but it fits the story perfectly, as it describes the rigid relationship of the two characters. Eventually, they catch a taxi to find Heni and the vehicle's tight space forces them to come closer again. Eliana and Bunda have to lower down their egos during the search for Heni, as this is the only way for them to solve their problem together. "Eliana, Eliana" is a journey of self discovery, for both Eliana, who gets to know herself and the pride that comes with her age, and Bunda, who rediscovers herself under the influence of modern life. At the same time Heni has her own conflict, the taxi driver an interesting background, and Ratna (Eliana's friend) is a character that symbolizes the tough life in Jakarta. audience comprehend his character's background as it complements the story. Yadi Sugandi's cinematography includes many sights in Jakarta's landscape, while he uses soft colors and brightness to present a more organic atmosphere. Riri Riza chooses to use a handheld camera and succeeds in making the audience feel like they are in the same place with the characters in the film, and to follow the character's development. Arianto Sinaga's set design is set as natural as possible.